Placement Trial at Talking Lens Productions in Leeds. This was an important opportunity for the company to access abilities and for the candidate to understand the expectations of the company. A wide range of tasks were given over the week, all within the pre-production sector. Assistance to fill content for a product on to the companies website. A pitch meeting discussing a new script in development, where the task of compiling a report about the structure, plot, themes and characters, was given. This was the main task throughout the week and was revised on the Friday before leaving. Gain a shadowing opportunity in a pre production house. To gain knowledge and insight in to the workings of a pre production house and network with those already working in the film and TV industry. From this network to gain a placement for the following year. 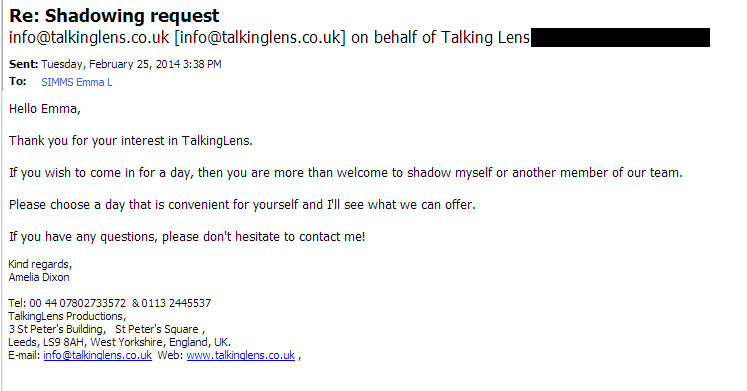 Contact was initially made on 25/02/2014 by email to Amy Dixon who was known to be working a Talking Lens Productions. A reply was swiftly received. Contact had been made and an opportunity made available. A date for the shadowing was set as well as a task to complete two script reports, to show any skills or abilities. Due to this being an unusual task, advice was given by Peter Rudge on how to go about. A template had also been provided by Talking Lens but it was still had to approach the tasks. The reports were swiftly completed in time for the shadowing and had impressed the company so another task was given to re-write a script. This was a fantastic opportunity to work professionally in an area towards a future career. Due to Talking Lens being a working pre-production house a disclaimer form was signed at the beginning of the day. However partaking in work was undertook and an interview discovering any script writing abilities was conducted. The day was packed and busy but has given influenced huge enthusiasm to work within the pre production area of the film industry. Work is continually been given by the company who will also be applied to as a work experience placement. Provides corporate video and animation services and was established in 2009. 03/02/2014: Met Martyn Lomax the managing director of Humanoid Productions at Staffordshire University after Business Lecture and received business card. 04/02/2014: Emailed Martyn requesting shadowing opportunity. 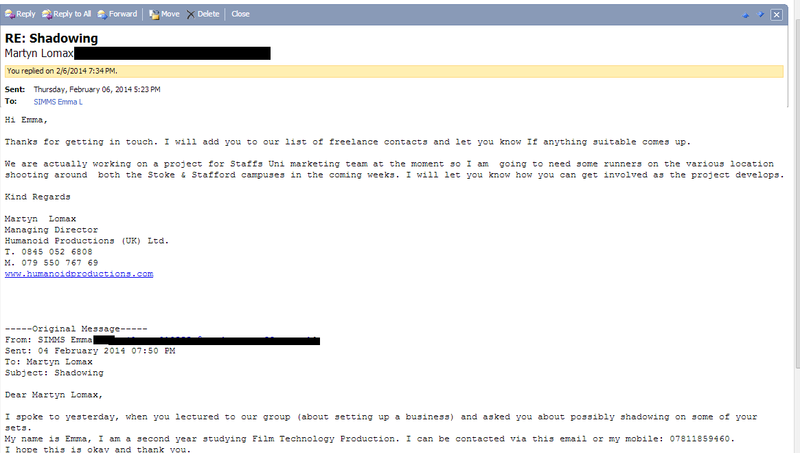 The email detailed that there maybe runner opportunities in the future which contact would be made via Humanoid’s freelance contacts list. 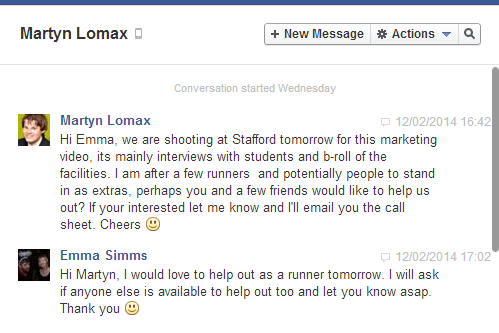 12/02/2014: Contacted about runner work for 13/02/2014 taking place at Staffordshire University, Stafford Campus. Arrived at 9am to greet the crew and set up. The crew consisted of the four founding members of humanoid productions Martyn, Chris, Tom and Anthony. The day would consist of collecting student interviews and b-roll of the facilities. After introductions, equipment was moved and assembled in the mo-cap studio where Sarah Blackburn was interviewed and demonstrations of the mo-cap systems given. Unfortunately it was at the beginning of this when Chris fell ill and was taken to A&E. This however led to more opportunities for the runner who became the interviewer and asked the questions to those being interviewed and was a line of sight to direct their eyes away from the cameras. Five more interviews followed in various locations, meaning equipment was constantly moved and re-assembled according to location. This was an amazing opportunity that allowed participation on the actual set of a corporate production in an environment that was still functioning at its normal capacity. It also showed the separation in roles but also how they interlinked. The shoot ran over time and the runner finished an hour after scheduled at 5pm that day. Therefore 8 hours of work experience were acquired by this opportunity which allowed further networking and an opportunity to work with Humanoid again.